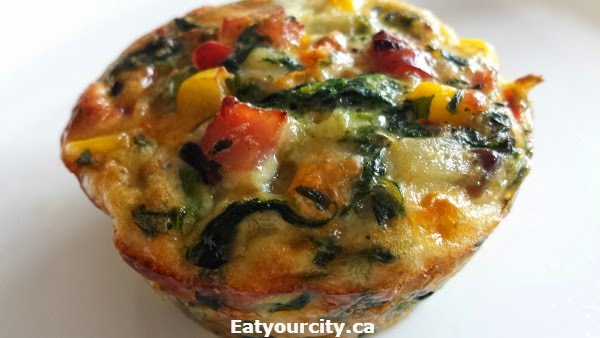 I'll tell you a little secret - I have a soft spot for quiches. I know its just a simple mixture of eggs, choice of vegetables or breakfast meats/seafood a splash of milk and baked into morsels of perfection... and I love eating them for snacks, noshing on them for breakfast or brunch... or sneaking a few here and there at functions off the appetizer table. Mmmm! 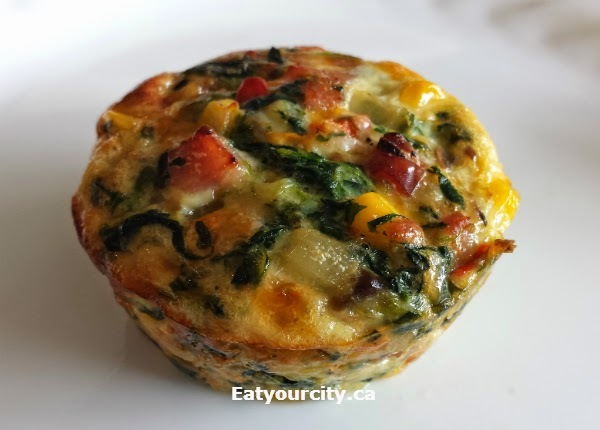 While quiche is normally made with the eggy goodness poured into a pastry shell, this recipe makes a much more waist-line forgiving version as it doesn't call for the fat laden pastry shell.. its crustless or crust free quiche! 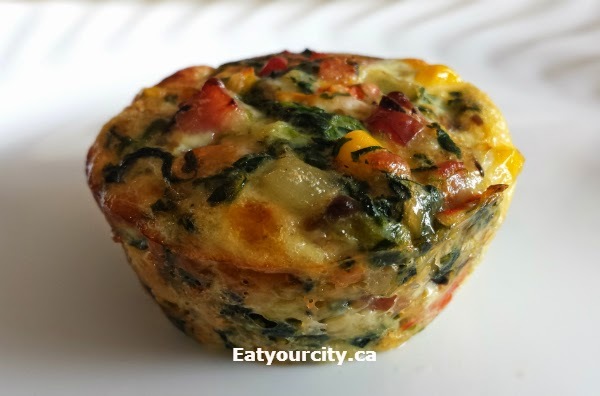 I like making mini quiches in a good quality non-stick muffin pan, but you can easily make it a full sized meal quiche by making it in a 9x13 well greased pan. The beauty of baking the quiche mixture in muffin tins or mini muffin tins is you get more of the lovely crispy browned caramelized edges. Plus, they're pre-portioned and easy to toss into lunches, breakfasts or for snacks the next day... and bonus - they look great as an appetizer for entertaining or pot lucks. I used a Wilton non-stick muffin tin.. love how it never sticks! And the best part (other than these delicious babies will disappear like magic) - they're healthy and you can customize to whatever filling you feel like having.. or whatever ingredients you happen to have kicking around. The more veges you cram into it, the less eggier it will taste, but look at these beautiful babies! 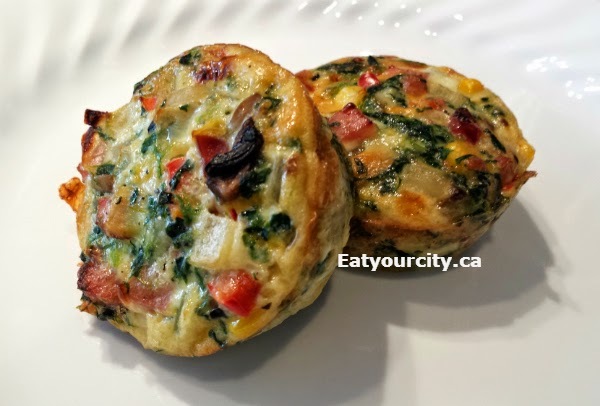 Quiche fillings - add as many or little as you like! 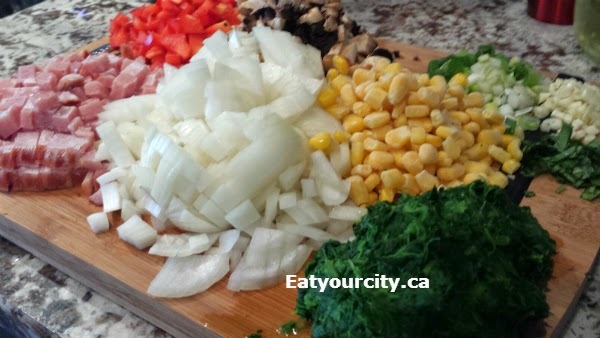 Quiche herbs and seasonings - add as many or little as you like! 2) In a medium pan, melt butter or add oil over medium-high heat. Dump in all your vegetables (and garlic and ginger if using) and cook for 5-6 minutes until vegetables have softened, onions are starting to caramelize. If baking in 9x13 pan - Dump the quiche mixture into the pan and bake in oven for 22-25minutes. Its done when until it no longer jiggles when you nudge the pan and the quiche has started to brown nicely on the sides and the center is puffs up. If baking in a muffin pan - Using a 1/4 cup scoop or carefully spooning - fill well greased muffin tin almost up to the brim. Depending on how much quiche fillings you added in determines how many quiches you'll end up with. Bake for 18-20 min. Its done when until it no longer jiggles when you nudge the pan and the quiche has started to brown nicely on the sides and the center is puffs up. If baking in mini muffin pans - Using a teaspoon, carefully fill the greased mini muffin tins almost to the brim. Its done when until it no longer jiggles when you nudge the pan, the quiche has started to brown nicely on the sides, and the center is puffs up. 5) Let the quiches sit and set inside their pans for about 10min on a cooling rack. 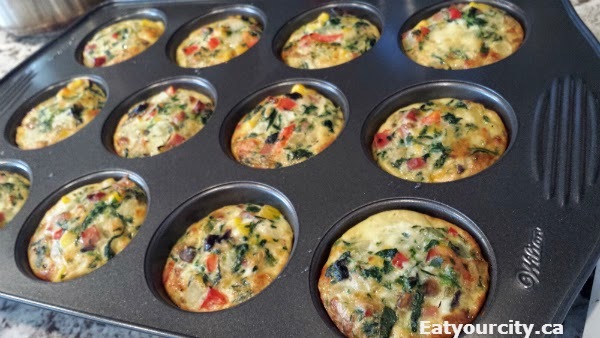 For muffin tins - gently pop out and serve, for 9x13 pan, slice up and serve. Enjoy! Goats on the Roof Coombs, Victoria - tasty eats!